© Sarah Halls Photography and Videography Ltd.
Summary: Refugees have conditions for voluntary return—conditions that political efforts to resolve the Syrian conflict have largely ignored. The ongoing conflict in Syria has created the biggest wave of displacement and refugees since World War II. Many will want to stay; others prefer to return home. Whether they do so depends on a number of conditions—including safety, security, and access to justice in their home country—that international political efforts to resolve the Syrian conflict have largely ignored. A year and a half ago, the Carnegie Middle East Center (CMEC) embarked on its Triggers of Return project. Spearheaded by CMEC director Maha Yahya, the project sought to improve the understanding of Syrian refugees’ predicament and what would make them want to return home. 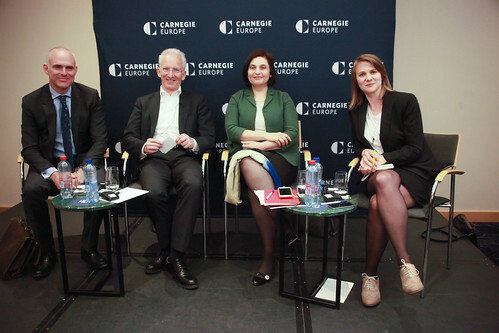 Carnegie Europe hosted a public discussion in Brussels to launch Yahya’s latest report, Unheard Voices: What Syrian Refugees Need to Return Home. Based on focus group discussions with Syrian refugees and a series of workshops with NGO professionals and experts on Syria, migration, and conflict resolution, the report offers policy recommendations that place refugee demands at the center of any sustainable political resolution of the Syrian conflict. Yahya was joined by Carnegie’s Stefan Lehne, author of a recent article that explains why “The EU Remains Unprepared for the Next Migration Crisis”, and Simon Mordue, deputy director-general for migration at DG HOME. Charlotte McDonald-Gibson moderated. Stefan Lehne is a visiting scholar at Carnegie Europe. Follow him on Twitter @StefanLehne. Simon Mordue is the deputy director-general for migration at the Directorate General for Migration and Home Affairs of the European Commission. Maha Yahya is the director of the Carnegie Middle East Center. Follow her on Twitter @mahamyahya. Charlotte McDonald-Gibson is an independent journalist and the author of Cast Away: Stories of Survival from Europe’s Refugee Crisis. Follow her on Twitter @cmcdonaldgibson.